The Catch-All Principle allows you to covertly position a free selection at a predetermined position in the deck. It does this with the help of two key cards. The real strength and novelty of this principle is that at crucial moments the spectator is free to cut the deck, which makes it seem impossible that the selection will end up at a predetermined position - but it does. Perhaps the best use of this principle is for ACAAN type effects as Nick Conticello himself demonstrates in his SODACAAN effect (see below). With the Catch-all technique it is possible to place an unknown selection at an unknown but predetermined position from the top of the pack. This is a significant step forward in impromptu ACAAN theory. I am curious to see where others may take this idea. 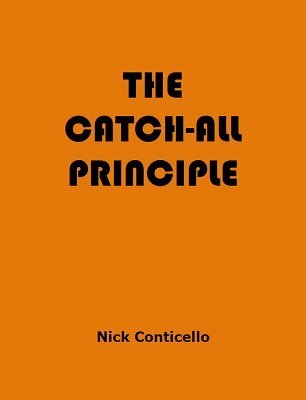 Besides a detailed explanation of the principle itself you will learn two routines that use the catch-all principle. A one deck Do-As-I-Do effect, disguised as a test of a volunteer's aptitude for card magic. A spectator shuffles a borrowed deck, the performer cuts it and the spectator cuts it. The spectator thinks of a number in the twenties, and writes it on a sheet of paper if he likes. He adds the digits of his number and notes the card at the total, then buries the card in the deck himself. The performer points out that he knows neither the card nor the number, but he will attempt to move the thought-of card to the thought-of number. The performer runs through the deck quickly and moves a group of cards from the center to the bottom of the deck. The spectator takes the cards, announces the number he thought of at the start, and counts to the card at that position. Amazingly, that card proves to be the very card he thought of. Suitable for close-up, platform, or stage. ANY shuffled, borrowed, incomplete deck. NO pre-show work or preparation. NO work in the cards.